It may sometimes be necessary to add information to a document that is made up of other pieces of information (concatenate fields, truncate fields, transform fields, etc…) – that is, information that does not readily exist in your system (like a customer number for example), but can be generated or deduced. In this snippet we look at how you can add some custom logic in your SAP S/4HANA Cloud system to generate a check digit to a BPay CRN (Customer Reference Number). That is, we want to offer our customer the BPay payment method and for that we have to add to the invoice a CRN number, that will be made of the billing document number appended by a check digit that we will generate on the fly in S/4. You will below find the custom logic that I used to generate this check digit (Disclaimer : my code is probably dirty – but it works). I am not checking the length of the billing document number – I have made the assumption that the billing number will always be 8 digits long. I have also added a screenshot that shows how my custom ‘CheckDigit’ field was defined (Numerical – 1 digit). SHIFT lv_billingdoc LEFT DELETING LEADING '0'. IF ( Counter MOD 2 = 0 ). lv_billdigit = lv_billingdoc+Counter(1) * 1 .
lv_billdigit = lv_billingdoc+Counter(1) * 2 . IF ( lv_billdigit > 9 ). lv_billdigit = ( lv_chardigit+0(1) ) + ( lv_chardigit+1(1) ). lv_total = lv_total + lv_billdigit. IF ( lv_total MOD 10 = 0 ). billingdoc_extension_out-yy1_checkdigit_bdh = 10 - ( lv_total MOD 10 ). In case you are interested to have it, I am also adding the Excel file that I used to double check the check digit generation. The CRN numbers in the file and check digits were generated on the BPay generator web page. 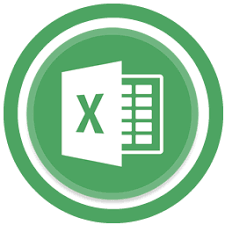 You can download the excel by clicking the icon below. In this snippet we re-visit a previously released snippet : S4HCKS23 Mass Processing Product Master changes in SAP S/4HANA Cloud, but this time leveraging an API that is called from the comfort of MS Excel. The underlying objective of this snippet, is to show how easy it is to leverage our API’s from third party applications, not just in Read mode, but also in Create/Update Modes. In this snippet we show you how you can supplement your Product Masters with MRP Areas, but this coud apply to any other of the available API’s. As indicated in the recording, I am providing the excel used in the recording, for you to try out and get some inspiration from. As a disclaimer : You can use it at your own risk – I take no responsibility for you using it. I encourage to first try it in your Q system, with a small dataset. I also remind you not to pass this file to others with either data and / or login credentials ! I must also give credit to Philip Hoffmann, who’s blog provided the file that I have also used to kick start this project. Phillip’s blog also covers how to create a communication user. You can download my MRP Areas Excel API file below, by clicking the Excel File icon. The stated requirement was to be able to have a KPI tile in the Fiori Launch Pad, that would show a count of the customers that had been able to reach one of two (or both) sales tiers. A sales tier being a sales volume. The numbers are not realistic, but let’s say that tier 1 would represent customers that had been able to reach a sales volume of 1000USD and tier 2 would represent customers that had been able to reach a sales volume of 2000USD. This volume had to be reached over a specific period of time, and if the customer reached one of the two tiers, over that specified period of time, he would then be eligible for a credit (or a rebate if you prefer). The higher the tier achieved, the greater the credit issued. As you can see, using standard features of S/4HANA Cloud, this was achieved quite easily. The next requirement, was to be able to drill down to a graphical representation of these sales volumes and clearly highlight the two sales tiers (1000USD and 2000USD), so as to be able to instantaneously visualise which customer had reached these tiers. Again, as you can see below, this and much more was achieved using standard capabilities of S/4HANA Cloud. 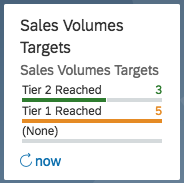 Not only were we able to build the desired graphical representation of the sales volumes and sales tiers, we also added mini charts (mini KPI’s) as well as various evaluations, so as to be able to slice and dice the information in various ways. So far, the customer brief was met. However, thinking about the use of this data, it quickly becomes evident that the next steps to be taken on the basis of this data, is to be able to issue the due credit to the eligible customers – but how are you going to do it? From the app above, it is possible to present the data in tabular form, you could even add calculated fields in the evaluation of your KPI tile to calculate things such as the amount of the credit. You could also export the data to a spreadsheet and there also calculate the credit due. Then, you are left with the need to create the credit memo in the system. Whilst of course possible, this is fraught with risks (badly slicing the data could lead to over/under issuing credits) and of course immensely tedious – imagine someone entering a large amount of documents in the system manually (again fraught with risks). That said, thanks to S/4HANA Cloud and the power of extensibility there is a much better, faster and leaner way to do this. What we did, was to use the ‘Custom Business Object’ in S/4HANA Cloud to define a new object – Sales Volumes tiers. The custom business object allows you to define the structure of the object that you need as well as the fields that define this object. In our case we needed fields that would pertain to customers, (customer ID, name, sales organisation…), tiers information (the volume that needed to be achieved as well as the % of the credit that would be issued). Lastly we also wanted to restrict how the volume was going to be measured. I.e was all the customer’s business going to count, or did we want to restrict by a set of materials or materials groups for example. We chose the material group. A snapshot of part of the structure of our Custom Business Object is shown below. Once the custom business object was created, we then used some coding to realise the magic of the process, namely, to call a CDS to sum the amounts billed to the customer, and on the basis of that determine the amount of the credit to be issued to the customer (if eligible). Then we perform a second call to a whitelisted API to actually create the credit to the customer. Creates a custom business object with the required structure and fields. We added some logic, to call the CDS I_BillingDocumentItemCube so as to sum the sales volume of the considered customer. One the basis of the sales volume determined, and based on the sales targets of the customer, we determine if the customer achieved the Tier 1 or Tier 2 target and if he did, we calculate the corresponding amount of the credit he earned. We then make a POST call to the whitelisted API API_CREDIT_MEMO_REQUEST_SRV, to actually create the credit memo in the S/4HANA Cloud system. Looking at these steps, you can imagine the level of automation that was achieved as well as the added value offered! Please check out the blog from my colleague Arun here : https://blogs.sap.com/2018/06/13/mass-update-using-sap-s4hana-cloud-in-app-extensibility/ . His blog will show you what you need to do to setup the required communication arrangements. I would like to thank Arun for his wonderful blog which provided the missing pieces to mine as well as his pointers along the way. All code provided below is provided as-is. You take full responsibility for using as it nowhere near production grade code. Below is the code for the first action. It retrieves the sales volumes from the billing CDS and works out the credit due to the customer. DATA: netamount TYPE P DECIMALS 2. DATA: internetamount TYPE P DECIMALS 2. DATA: bonus1 TYPE P DECIMALS 2. DATA: bonus2 TYPE P DECIMALS 2. DATA: products TYPE TABLE OF i_productgroup. DATA: product LIKE LINE OF products. LOOP AT bonusproducts INTO DATA(bonusproduct). netamount = internetamount + netamount. salesvolumestiers-calculatedbonus_v = ( ( netamount / 100 ) * ( salesvolumestiers-bonusrate2 ) ). salesvolumestiers-calculatedbonus_v = ( ( netamount / 100 ) * ( salesvolumestiers-bonusrate1 ) ). Then the next piece of code is that which is used create the credit memo per se. Again you will want (have to!) add your own error handling code and execution logic. DATA lv_s2 TYPE string VALUE '/API_CREDIT_MEMO_REQUEST_SRV/A_CreditMemoRequest?%24top=1&%24format=json'. request->set_header_parameter( exporting name = 'X-CSRF-TOKEN' value = 'FETCH' ). request->set_method( 'GET' )->set_resource_extension( lv_s2 ). DATA(response) = lo_client->send( request ). DATA(lv_csrf) = response->get_header_parameter( 'x-csrf-token' ). lv_pl48 TYPE string value '"} ] } ] } }'. DATA lv_s1 TYPE string VALUE '/API_CREDIT_MEMO_REQUEST_SRV/A_CreditMemoRequest'. request1->set_header_parameter( exporting name = 'x-csrf-token' value = lv_csrf ). request1->set_method( 'POST' )->set_resource_extension( lv_s1 ). DATA(response1) = lo_client->send( request1 ). DATA line LIKE LINE OF result. FIND ALL OCCURRENCES OF REGEX '((? :[^<]| LOOP AT result INTO line. LOOP AT line-submatches INTO sub. 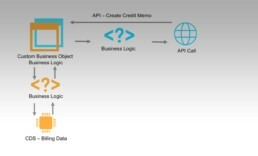 So in this snippet, we will use a custom business object as the starting point, expose the data from this custom object as an Odata service, consume it as a service that is registered as a destination on the SAP Cloud Platform – and all that on an native iOS app built with the SAP iOS SDK. Why? Because I want to demystify the preconceived idea that this is too complex and in fact show how easy it is to do all this with the tools that SAP provides. I am by no stretch of the imagination a developer, so if I can do it, then so can you. Furthermore, all the tools used in this snippet are free, so there really is no excuse to not give it a go! You just need an Apple Mac! There are certain things that are not covered in this movie, such as creating a communication arrangement in S/4Cloud, or what you need to do on the SAP Cloud platform, where to download the iOS SDK, etc…. There are plenty of blogs, videos and tutorials out there to help you for that. I have however listed a few choice ones below that I found very helpful during my explorations. Lastly, I would like to point out that I was damn impressed with how much the development team was able to pack in this SDK! As you will see in the video, after having indicated just the web service that I want to consume, the app that is built out of the iOS SDK is just so complete! Sure you cannot put that in the hands of your users, but the amount of functionality that is delivered in this app, without needing for me to type a single line of code is just mind blowing. It sets the stage for you to be able to, with minimal changes, to build an awesome app to your users. If you enjoy this post, please consider subscribing to our youtube channel and follow the hashtag #S4HCKS on twitter.